Bluff City Coffee has been busy revamping their baked good case. 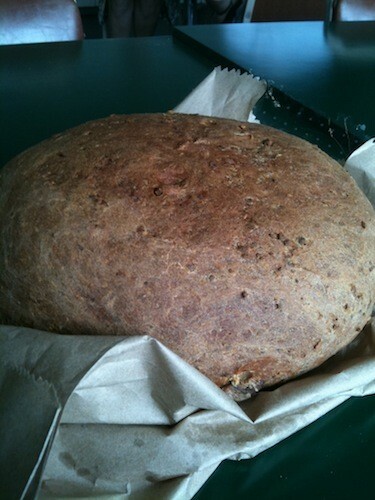 I had an excellent strawberry cheese tart a few weeks back, and today picked up this massive gouda walnut loaf ($6.95). Also available today: sundried tomato, cranberry, and olive. 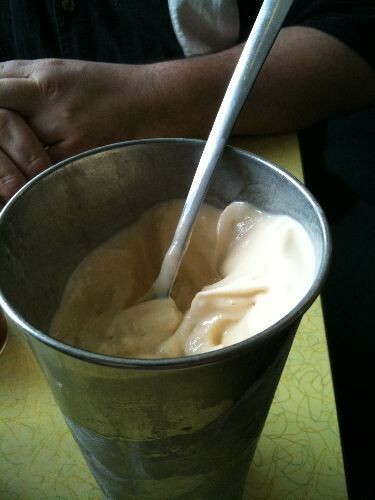 Many years ago, on my first attempt to order a Wiles-Smith milkshake, the person behind the counter refused me service. Seems that on that day she had scooped so much ice cream for those famous shakes that her arm had given out. On that day, I was sick with disappointment. 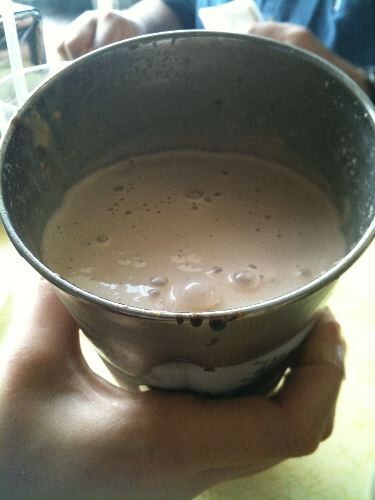 Today, I'm sick because I had too much milkshake. 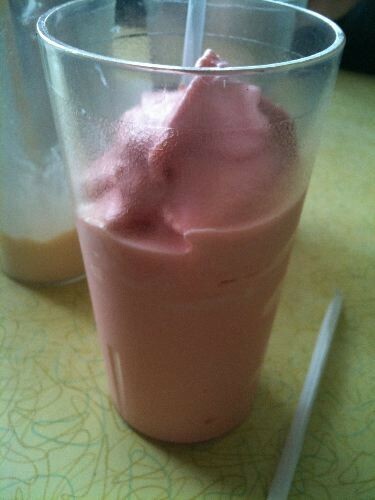 This is the extra-thick vanilla and strawberry ($3.50). We also tried the vanilla shake and chocolate malt. 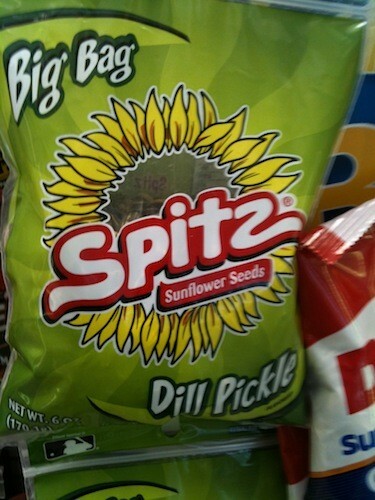 Spotted at the Hop In at Poplar and McLean, Spitz dill-pickle sunflower seeds. I admire the audacity. A bake sale is being held on Saturday, June 23rd, 10 a.m.-1 p.m., to raise funds for Shannon Parker, a victim of a hit-and-run. On Sunday, May 20th, Shannon Parker and Kat Solaas were hit by a car while crossing the street in Cooper-Young. Parker tried to push Solaas out of the path of the vehicle and sustained multiple injuries, including a fractured pelvis and is receiving treatment at the Med. Solaas broke her ankle. Parker has no insurance. 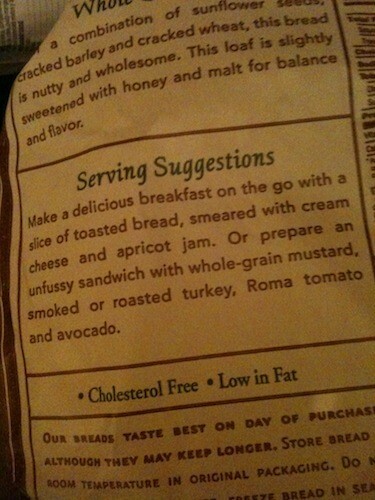 It struck me as funny that the serving suggestions on this bag of Le Brea whole grain bread breaks down to toast and sandwich. Last week, I stopped by the Cottage for a late lunch. While I was more than a little tempted to get breakfast (served all day! 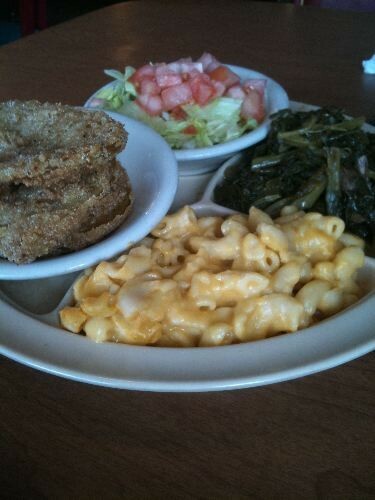 ), I went for the vegetable plate ($8.50 with drink). Smack dab in the middle of the ocean of barbecue currently covering Tom Lee Park is a small island (to torture this metaphor) devoted to Buffalo chicken wings. The wings come with the Frank's To the People bus, sponsored by Frank's RedHot sauce. 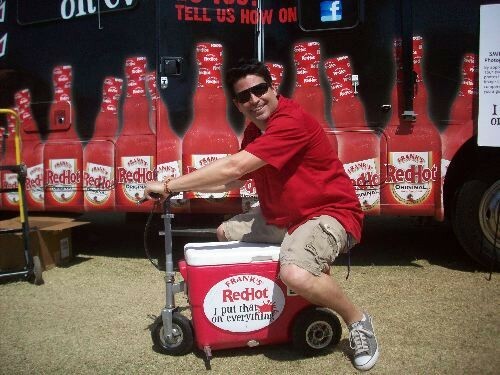 The bus is traveling the country making stops at contests and festivals just like the World Championship Barbecue Cooking Contest in order to spread the gospel about two Frank's products: the Sweet Chili sauce and the new Thick sauce. Restaurateur, cookbook author, one-time host of TLC's BBQ Pitmasters, and Frank's pitch man Kevin Roberts sees it as enjoying basketball while enjoying football. It's all about sports, and here at Barbecue Fest, it's all about food. 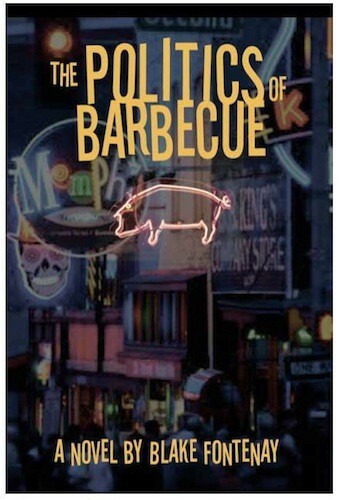 Due for release this September: The Politics of Barbecue, a novel by former Commercial Appeal staffer Blake Fontenay. 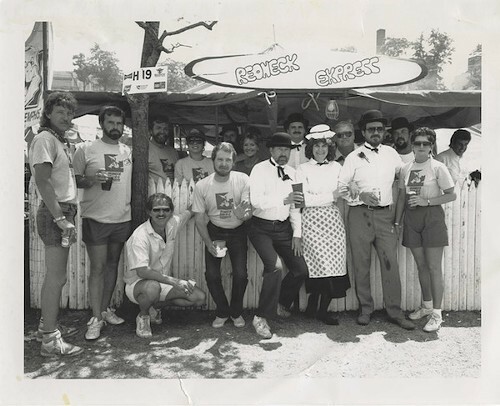 Redneck Bar-B-Q Express has been competing in the Memphis in May World Championship Barbecue Cooking Contest since the first year, 1978 (when the contest was held in a lot near the Orpheum), and they've been back every year since. • According to team bio: "Our entry form was the first to be into to Memphis in May." • The team name was inspired by Federal Express (now FedEx). • The team was the first to prepare a whole hog, rather than just shoulders and ribs. • Original team members: Pete Gross, Woody Coleman, Tommy Coleman, Mike Stals, Roy Nolen, and Mike Rivalto. I wrote some time ago about the Lunch Bully. He or she is that person who dictates restaurant choice because of dietary restrictions, quirks, or sheer stubbornness. 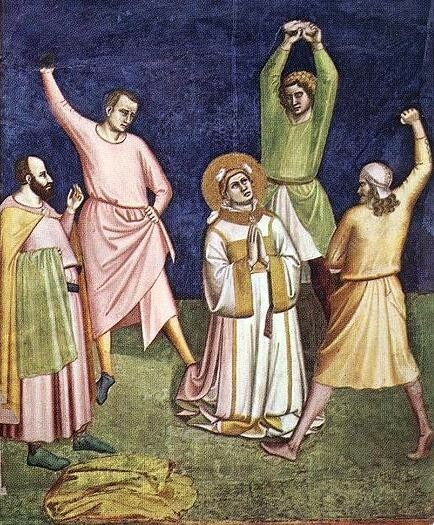 I only recently discovered there's another sort among us: the Lunch Martyr. 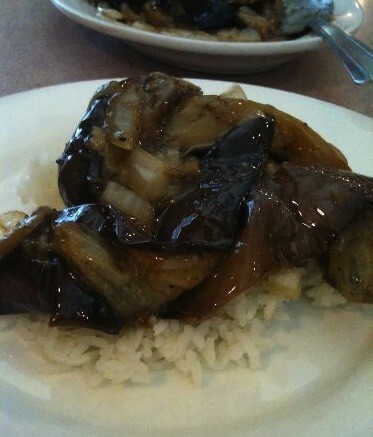 As I was enjoying my lunch of Eggplant with Black Pepper Sauce ($8.75) at New Asia, I daydreamed about recreating this perfectly spicy dish at home. And who am I kidding anyway? Nothing I would make would be as good as New Asia's, so I might as well leave it to the experts. Mother's Day is Sunday. You wouldn't dare not have your mother properly brunched, would you? Here's a list of brunches. 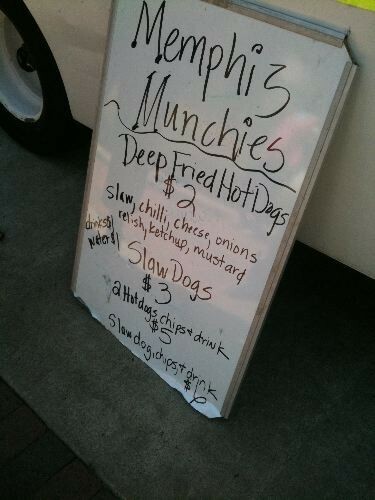 We had to check out today's Food Truck Rodeo, the debut event of the new Memphis Food Truck Alliance. We got there just as the crowd was filling Court Square. Among the trucks at the rodeo: Fuel, Memphis Munchies, YoLo, Scooter's Bar-B-Que, Revival, Healthylicious, Mark's Grill, Kona Ice, and Scratch. Of course, the first thing that caught our eye ... Deep Fried Hot Dogs! 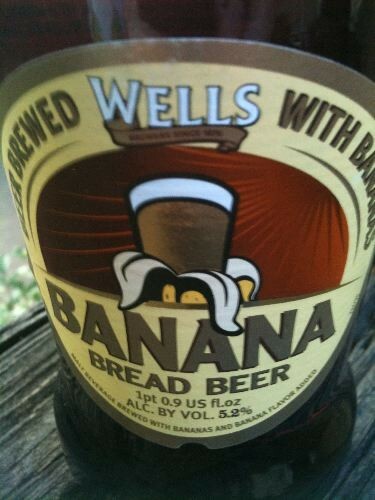 I spotted Wells Banana Bread Beer ($6.49) at the White Station Fresh Market yesterday. I like banana bread and I like beer, so why not? I don't make it to Fino's as much as I would like. 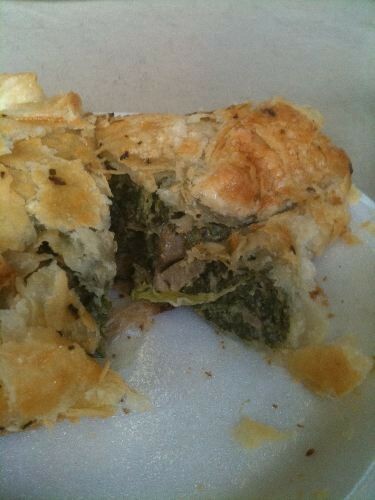 On my last visit I found some more incentive: the Spinach-Mushroom Turnover ($2.75). 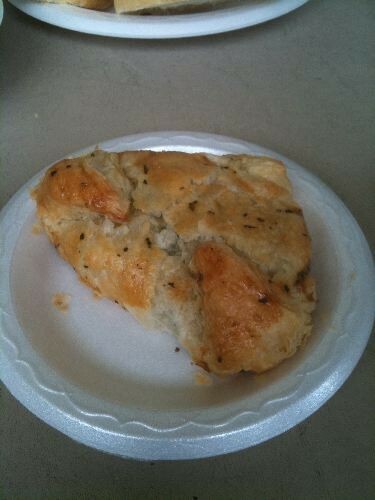 This is one of the turnovers offered on special most, though not all, days. Others include: spinach-artichoke, spinach and three cheese, and spinach and roasted red pepper.